Representatives from Cunamm Óige Chroí Éanna, supported by Fóram na nÓg and the NI Youth Forum met with Arlene Foster today to represent the views of young people in relation to the call for an Irish Language Act. Cumann Óige, Chroí Éanna is an Irish Language Youth Club, based in Glengormley and linked to Gaelscoil Éanna. It was established in 2011 and has around 200 registered young people. 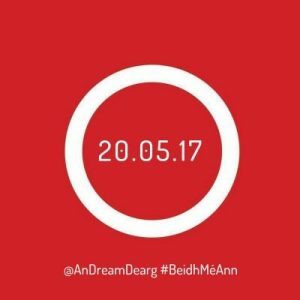 The group have been working on a local campaign to highlight the need for an Irish Language Act and raise awareness of the barriers and discrimination they face in their every day lives as young Irish speakers. As part of their Campaign the young people requested a meeting with Arlene Foster to allow them to articulate their views on this very important issue. At the meeting today, youth work staff, acted as advocates for young Gaels. Consultation findings from the ‘Network for Youth’ project were discussed where young people argued strongly for an Irish Language Act on the basis of provision of services; inclusion; and anti discrimination. A letter written by Gaelscoil Éanna pupil, Martina Borysowska, expressing her views of the Irish Language and the need for an Act was also tabled. A most positive conversation took place that included areas such as Education; Youth Development; providing voices for the seldom heard; discussion on the diversity which exists within the Irish Language Community and its origins; and mutual understanding, with a view to facilitating future meetings directly with Irish Speaking Young People following the upcoming elections. We look forward to continuing a conversation which we begun today and are very thankful to Arlene Foster, Christoper Stalford and their party colleagues for the opportunity and for taking on board the views of young people.